Today, I thought I’d take you through my collection of RPG books. That is, my physical collection. 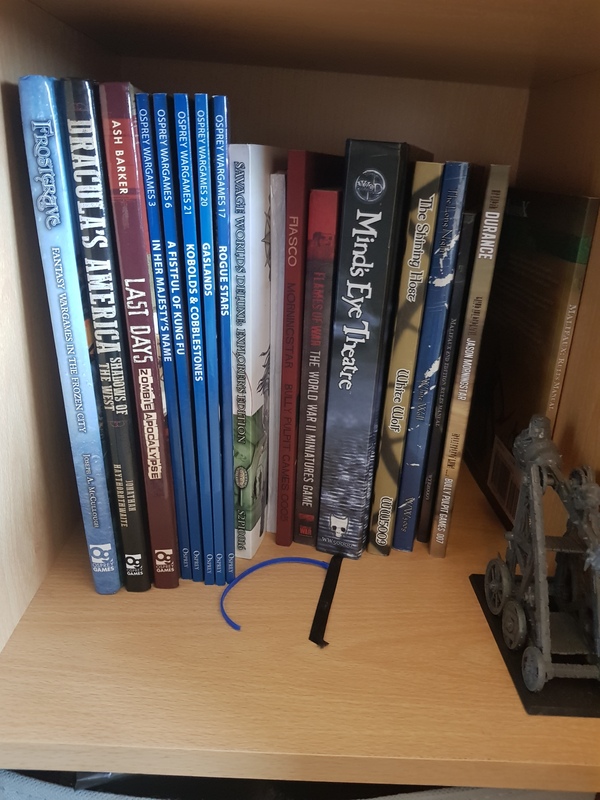 As you can probably surmise from my frequent links to Bundles of Holding, I have a lot of digital copies of RPG books, too. Those folders are vast, but also unimpressive and ultimately less satisfying from a collector’s standpoint as they exist only as text and images on a hard drive. Let’s focus on the tangible! As with most collections, not all items are created equal. Some items are used very regularly. Others, rarely. Some have never been used and, in those moments when I am being honest with myself, probably never will be used – at least not as intended. I am still sans-computer, so bear with me on formatting, typing, etc. It ain’t great! 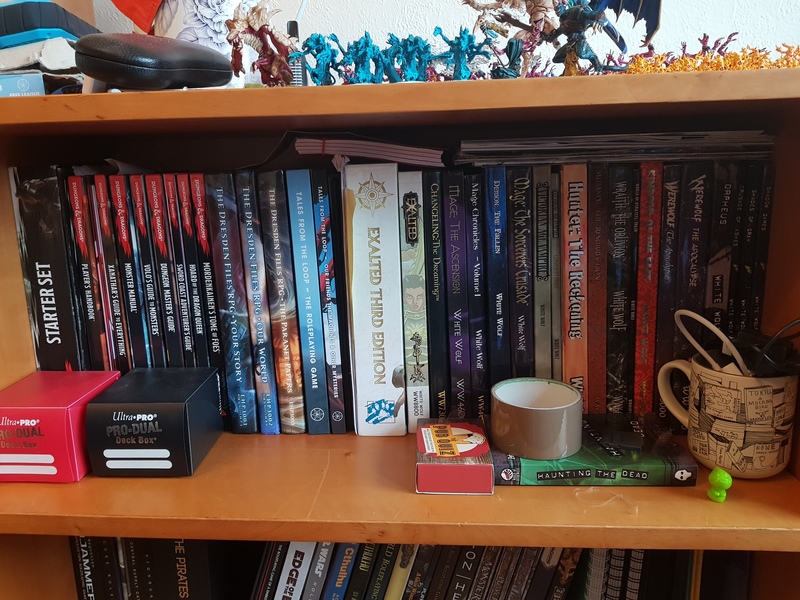 The shelf starts with Dungeons & Dragons 5th ed. As you can gather from my Hobby Update posts I use these books regularly. Between my Wednesday and Friday groups, an irregular Thursday one, and an after-school group for a rapidly-growing number of children, the pages of the player’s handbook are well-thumbed. I find the supplements quite useful, too. My most useful supplements have been the Monster Manual, Xanathar’s Guide to Everything and Volo’s Guide to Monsters. Volo’s is probably my favourite book of this edition thus far, though I am looking forward to seeing the upcoming Ravnica book. After D&D, we see the three books of The Dresden Files RPG. 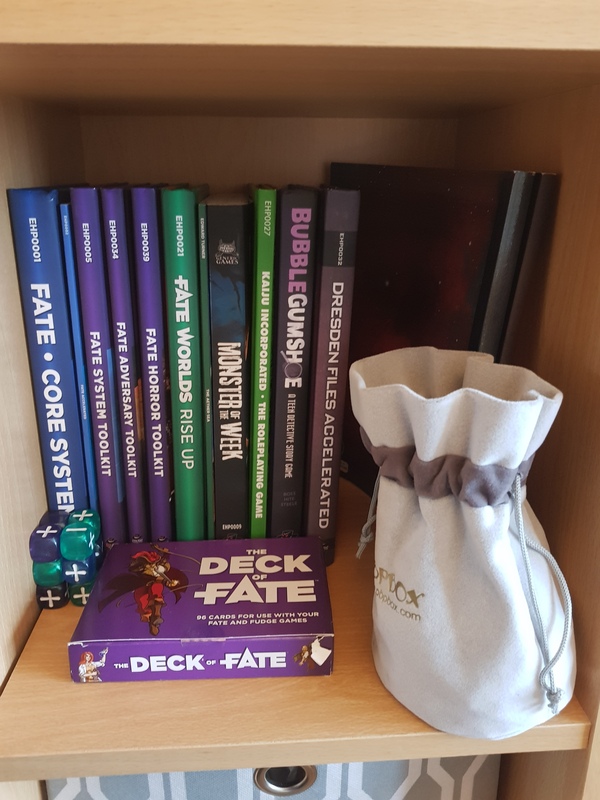 Not only do these volumes comprise a fantastic game, but they are wonderful objects on their own right, being fantastically produced and bursting with theme and personality. I ran a very successful campaign a couple of years ago and I am delighted that I have a new campaign starting this Thursday. I will have to share how that goes. Next up, we have Tales from the Loop, along with the GM screen and the supplement, Our Friends the Machines & Other Mysteries. I’ve yet to play this game and I don’t see it making the table in the near future. The books are beautiful and I love the artwork. The game seems good, too. I like the idea of it. I’ve just not managed to drum up a group yet. Next up are the first and third editions of Exalted. The first edition book is great, with some really cool art and loads of interesting stories and rules. The game is functionally similar to the World of Darkness games, but is very different in terms of tone. The third edition book is a beast. It is massive – the largest single book in my collection. The artwork is different, being more whimsical in places and using watercolours. It is thorough, detailed and very much a complete system. I’ve owned Exalted since the first edition was released in 2001, but i’ve never played it. I’d love to remedy this at some point but I’d need to do a lot of reading, first. As an aside, I remember when 2nd edition Exalted came out and the publisher ran a promotion whereby you could get a copy of the game by sending in and trading your D&D 3.5 player’s handbook. Cheeky! None of these have been played in their own right, but several have been used to inform or adapt my games of Vampire: The Masquerade. There are some games, such as Wraith, Mummy and Kindred of the East, that I don’t feel I want to play, whilst I’d be very keen to run Orpheus or Changeling. Loving the World of Darkness as I do, I’m just really happy to own these books to read them and flesh out a setting that I adore. This shelf is all about White Wolf. It’s all World of Darkness and New World of Darkness (now Chronicles of Darkness). First up, we have a couple of Dark Ages books. Namely, we have Dark Ages Vampire and Dark Ages Inquisitor. Dark Ages Vampire is cool because even if you don’t play it – and I have not – you still get a cool, historical setting and context that can be drawn upon and referenced in even your modern day Vampire: The Masquerade games. Inquisitor is interesting, too. I like their approach to the church of the time, almost creating a historical, religiously-motivated edition of Hunter: The Reckoning. Again, really good reading, here. Next up is my beloved Vampire: The Masquerade. I’ve had my Revised Edition core book since, what? 1999? 2000? Love it! I have been a player once and have ran it four times as storyteller/GM. It is one of my favourite games and I am always keen to break it back out. I’m hoping to run a Succubus Club-themed game after my upcoming Dresden Files campaign is done. So, I have the pretty standard supplements in the Storyteller’s Guide and faction guides. The Chicago books are good as I like using the Chicago setting. Otherwise, the books are very situational. I love how much cool material there is here and how varied it is. 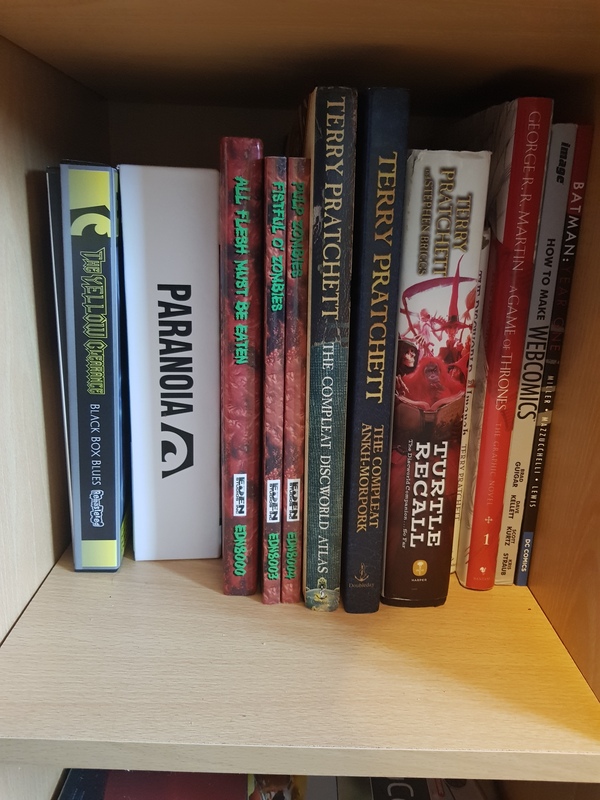 The rest of this shelf is technically the same, in that all of these books are NWoD supplements, but they are subdivided into different game lines. Vampire: The Requiem is a good game with fantastic rules that is much-maligned simply for not being Vampire: The Masquerade. I get it. The clans in V:TM were much cooler. In addition to the core book, I have the Coteries supplement and two historical setting books: Requiem for Rome and Fall of the Camarilla. These give you a look at vampires both at the height of their power in Rome and in the aftermafh of their fall. The boomk are also gorgeous. That helps. As you can surmise, I really like the setting and stories around Werewolf: The Forsaken. I’ve yet to play it, but I do love reading about it. 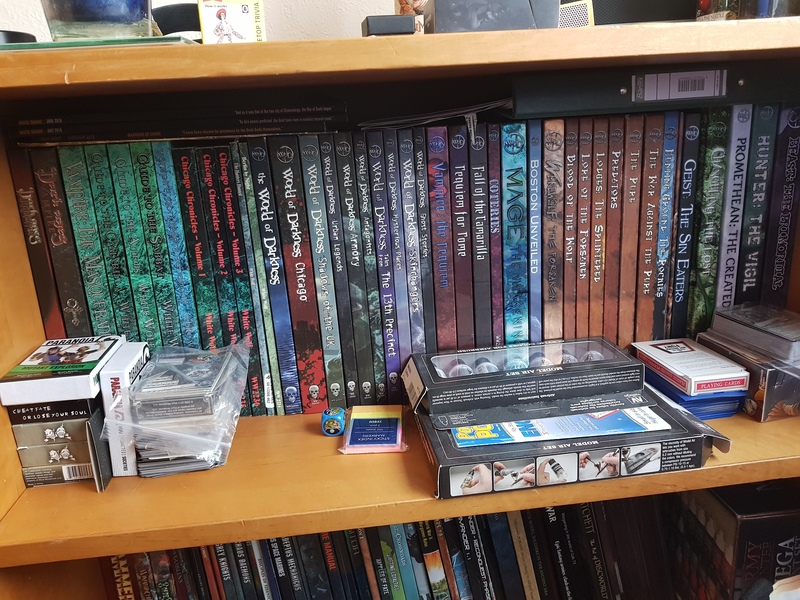 With the exception of Changeling: The Lost I haven’t played a game with this large pile of NWoD books and this doesn’t bother me as much as I’d have expected. I mean, I’d like to have a game or two, but it’s not like I’m deprived of RPG opportunities at the moment. Other games are just easier to find groups for or are more in the forefront of my mind. I still like the books and enjoy reading them. I think it’s fine to enjoy RPGs that way. I actually read a Guardian article recently on this very topic. I only ever played a couple games of 3.5 and a very brief dabble into 4th edition, so these are pretty much unused. I just don’t like the idea of throwing them away. There’s a copy of Infinity in there, too. It’s not mine. I’d better return that, actually. Not pictured is a copy of Rogue Trader. It is currently out on loan. These have mostly been picked up either when they’ve grabbed my attention, like LotR and Discworld or for a game I was invited to join, as with Scion, both Star Wars books and Call of Cthulhu. Paranoia! The new Mongoose edition is great and i was quick to pick up the Red Clearance core box and the new edition of the Yellow Clearance Black Box Blues. I also have the forms pack, the two decks of cards and the Implausible Deniability book, all tucked into the other boxes. All Flesh Must be Eaten and the pulp and western supplements were picked up at Claymore almost a decade ago and haven’t seen any use – though there’s some good reading in them! The rest of the shelf is just assorted books. The gathering of Discworld maps and info books is for me to put together some Discworld material for FATE. I love that world and am really keen to run a game at some point. Most of the books on here are Osprey Wargames. I like these, but let’s put them aside for now and focus on the RPGs. Savage Worlds seems a decent system that I was thinking of using for a few different things. Problem is, I’ve since discovered FATE and would generally rather use that. There’s a lot of stuff here I don’t see myself ever playing. Durance is a really good read, but I don’t know that I’d get it to the table. The Mind’s Eye Theatre stuff was mostly picked up out of morbid curiosity. I don’t think I’ll be LARPing, and if did wabt to LARP, I’d probably do something with a lighter tone. The only book on this shelf I really want to get to the table is Fiasco. That looks fun. I also have no excuse for not getting it to the table, considering how little prep and fuss it actually involves. I also picked up Monster of the Week and Kaiju Incorporated, two standalone games that use the FATE rules. They both seem fun and build on the core system in different ways. It’s also useful to see how these implementations are done, as I’d like to put together a little Discworld book for my group. There’s also Dresden Files Accelerated. Like the larger Dresden Files RPG books, this is a beautifully produced tome, bursting with rules, charm and wit. Good art, too! In addition to being a game in itself, it’s an inspirational wee book, full of ideas for the bigger game. Finally, there’s BubbleGumshoe. This is Evil Hat’s take on the Gumshoe system. I liked the Gumshoe System as it was presented in Trail of Cthulhu, so was really interested to check out this implementation, based around teen detectives. A recent purchase, I’ve not had the chance to properly read it yet. Looking forward to it, though! That’s the collection as it currently stands. 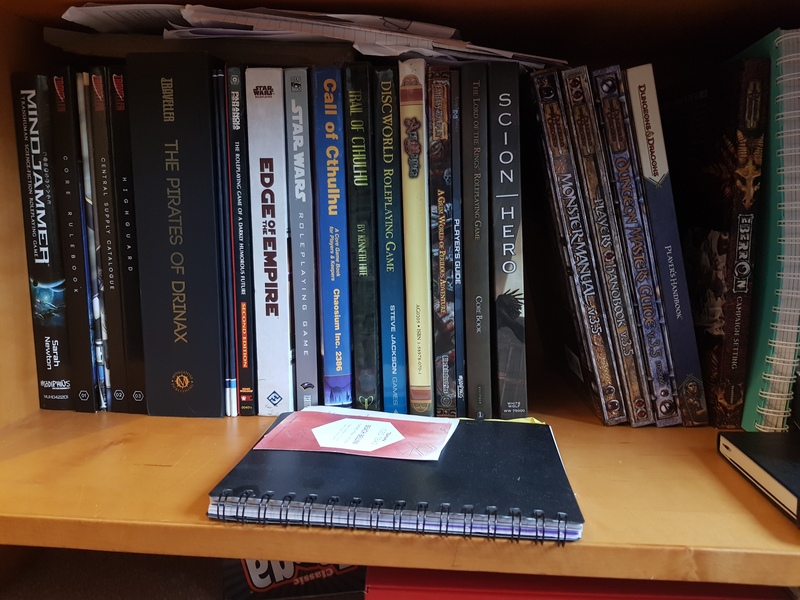 I have a lot of books for the systems I really like and a lot of odds and ends for systems I have dabbled in or in which I hold or have held a passing interest. If you reckon you know a system or book that I would particularly enjoy, drop me a comment. Always happy to hear recommendations. Previous postAre Modern Games Overproduced?